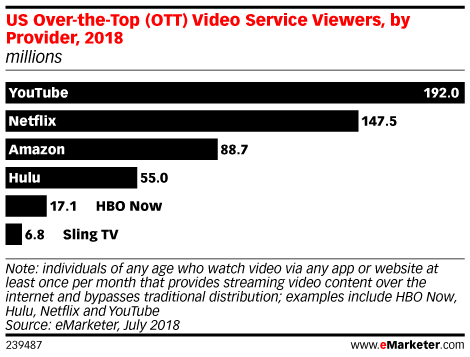 Even as traditional pay TV providers form partnerships with former over-the-top (OTT) rivals to retain customers, cord-cutting continues to outpace projections. 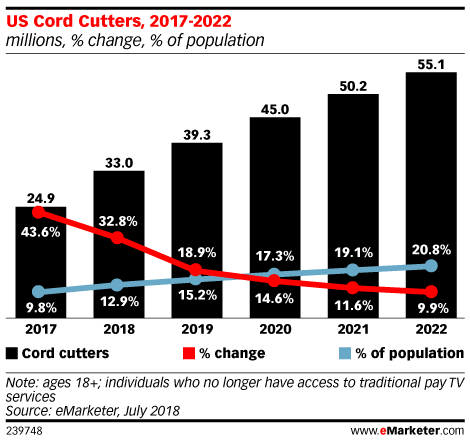 According to eMarketer’s latest US pay TV/OTT forecast, the number of cord-cutters (adults who’ve ever cancelled pay TV service and continue without it) will climb 32.8% this year to 33.0 million. That’s higher than the 22.0% growth rate (27.1 million) projected in July 2017. Overall, 186.7 million US adults will watch pay TV (cable, satellite or telco) in 2018, down 3.8% over last year. That’s slightly higher than the 3.4% dip in 2017. Satellite providers will have the biggest decline, followed by telco. Meanwhile, the streaming platforms are growing at the expense of pay TV losses. In fact, eMarketer has increased its future viewership estimates for YouTube, Netflix, Amazon and Hulu. Growth is being fueled by more original programming and demand for multiple services.